Welcome to Bishop’s Mills, Ontario – an historic village in the municipality of North Grenville, located just 65 km south of Ottawa, the Nation’s Capital. The Village had its origins around 1840 when two brothers, Chauncey and Ira Bishop, chose this location to build a sawmill and grist mill on the Middle Branch of the Rideau River. In the 19th century, the village boasted two general stores, post office, school, churches, blacksmiths, tinsmith and its own doctor. Today, residents of this picturesque rural hamlet demonstrate their pride in their heritage by actively participating in the community’s two churches, community hall, Women’s Institute and Community Association. This former Temperance Hall, built in 1878, still functions as one of the centres of community life in the Village. Today, the hall is used for public gatherings, music concerts, private functions and meetings. The hall is owned by the community, and operated by the Bishop’s Mills Community Association. To rent the Hall or inquire about its use, please contact Victor Desroches at 613-258-2115. Located a few kilometres north of the Village on County Road 18. Here lie the remains of some of Bishop’s earliest pioneers, including Chauncey and Ira Bishop, and dates go back as far as 1862. Inquiries, please contact Mervin Robinson, 613-258-4695. A listing of approximately 500 names organized by name and monument location. Prepared by Glenda Robinson and family. Help Support Our Community Hall! 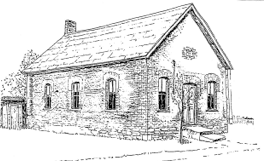 Copies of A Brief History Of Bishop’s Mills are available for $5 ([plus $3 s&h), which goes towards the costs of operating the Community Hall.